Electrochemical nanogap sensors form the basis of my current research. These sensors rely on redox cycling to allow for the most sensitive electrochemical detection down to the single molecule level, and they are used to fundamentally study the electrochemistry of mesoscopically small numbers of molecules in solution. My work is mostly centered on understanding the device physics of nanogap sensors by studying the interplay of molecular diffusion, advection, adsorption and electrochemical potentials. I developed nanofluidic cross-correlation spectroscopy as a new technique to study diffusive number fluctuations of molecules. 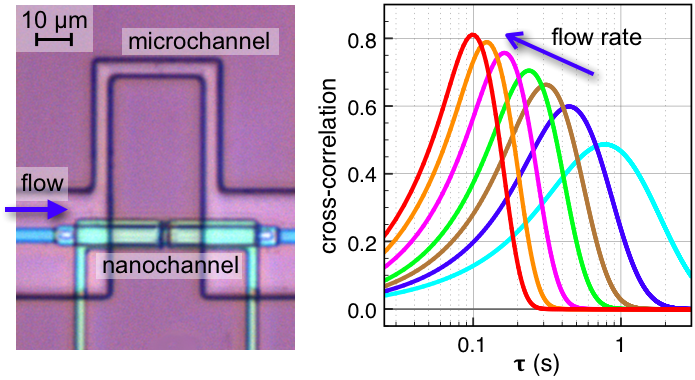 Using Parallel Flow Control, smallest liquid flow rates are generated in a nanochannel. 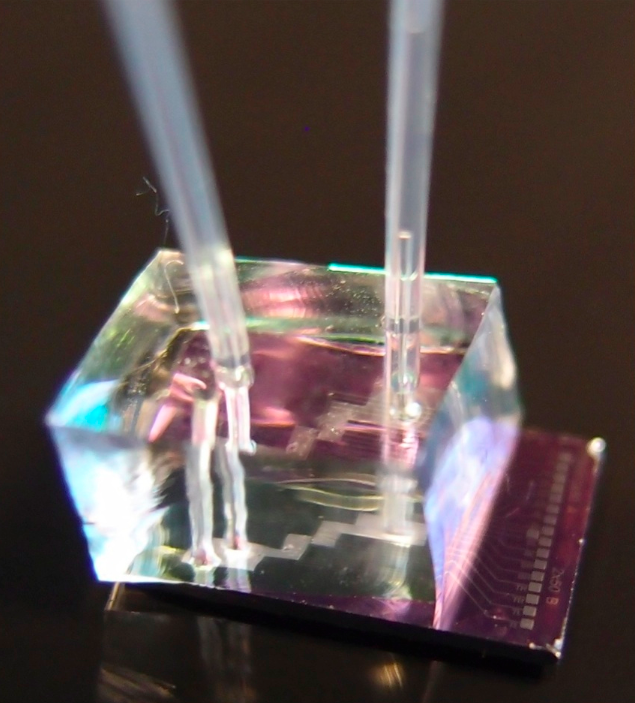 Number fluctuations of electrochemically active molecules are used as markers of liquid flow; by detecting their time of flight in between two consecutive sensors in a single nanochannel, it is possible to detect record-low flow rates below 1 pL/min. Goals of my current research are to extend this technique to precisely measure adsorptivity, diffusivity and lifetime of molecules, and to improve the sensitivity of electrical sensing to allow for the detection of single molecules in aqueous solution. There are two major techniques to study fluorescently labeled molecules: Confocal microscopy in solution, in which single molecules freely diffuse through a femtoliter-sized detection volume, and TIRF microscopy, in which hundreds of surface-immobilized molecules are imaged with a sensitive camera. By using specially designed nanofluidic devices based of Parallel Flow Control, we are planning to combine the advantages of both methods: a high time resolution for studying fast conformational changes (as is the strength of confocal microscopy) with the ability to monitor many individual molecules in parallel (as is only possible with image-based detection of fluorescence). Fluorescence measurements are performed at Johannes Hohlbein’s group at Wageningen University.